What is the benefit of positive thought? what you want to become in your life? what is a success?and how to compete oneself? 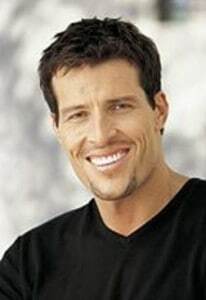 The 6-foot 7-inch tall Tony Robbins has a commanding presence and deep booming voice. And he is a very passionate speaker that loves helping people achieve their goals and to get more fulfillment out of their lives. Many motivational speakers are mainly fluff and not much substance. However, Robbins truly understands the psychology of success. “Long ago, I realized that success leaves clues and that people who produce outstanding results do specific things to create those results,” said Robbins. He begins his speeches by starting with basics such as what do you want to accomplish in your life and why do you want to achieve that goal. Then, Robbins goes into more detail about techniques and concepts that can help you accomplish your goals. My favorite quote – If you do what you’ve always done, you’ll get what you’ve always gotten. mentally retarded” while in grade school. potential, a key point in many motivational speeches he gives now. My favorite quote – Don’t let someone else’s opinion of you become your reality. A high school dropout. A homeless man. And now? Probably the most passionate motivational speaker ever. If we all had as much passion as him we would be on another level. He can motivate you to another level, his speeches are intense. I would suggest to every person that’s alive at this very moment and can still breathe to check out some of his speeches – You won’t be disappointed! Thomas does not sugarcoat anything. He is nicknamed the hip-hop preacher and he is as blunt as a rapper. Thomas also talks about how it may take years to accomplish your definition of success. But, if you are truly committed to your goals and willing to make the necessary sacrifices you will be successful. My favorite quote from ET – When you want to succeed as bad as you want to breathe, then you’ll be successful. I don’t know if there is a person who wouldn’t get inspired while listening to Nick. Nick Vujicic was born with no arms and no legs. Yet, he is a very happy man and he lives life with joy. He is also a funny guy with a good sense of humor. And Vujicic tells jokes in his speeches and pokes fun at himself. He teaches the importance of determination and never giving up. And quitting is not in his vocabulary. He believes nothing is impossible. And Vujicic stresses the value of not focusing on what you cannot do instead focus in life on what you can control and what you can do. My favorite quote – The challenges in our lives are there to STRENGTHEN our CONVICTIONS. They are NOT there to run us over. Arnold Schwarzenegger envisions the goals that he wants to achieve then he does whatever it takes to achieve that goal. He does not care about critics or naysayers. Schwarzenegger focuses on believing in himself and using his immense work-ethic, strong self-discipline and determination to accomplish his goals. Schwarzenegger speeches talk about how success can be difficult to obtain. But, you have to be stubborn and willing to conquer any obstacles you may encounter. And it is important to follow your heart to pursue what you want to accomplish in your life. Schwarzenegger talks about how you need to ask yourself who do you want to be? My favorite quote – Strength does not come from winning. Your struggles develop your strengths. When you go through hardships and decide not to surrender, that is strength. A talented author and motivational speaker, Zig Ziglar has an appeal that transcends barriers of age, culture and occupation. Since 1970, he has traveled over five million miles across the world delivering powerful life improvement messages, cultivating the energy of change. My favorite quote – What you get by achieving your goals is not as important as what you become by achieving your goals. Dr. Wayne Dyer has written many books and featured many programs on PBS. Although born into poverty Dr. Dyer overcame this to live his dreams. Some of Dr. Dyer’s motivational speaking programs include The Power of Intention; Change your Thoughts, Change your Life; Your Ultimate Calling and Excuses begone, among others. Dyer proceeded to build on his success with lecture tours, a series of audiotapes, and regular publication of new books. He often recounted anecdotes from his family life, and repeatedly used his own life experience as an example. His self-made man success story was a part of his appeal. My favorite quote – Be miserable. Or motivate yourself. Whatever has to be done, it’s always your choice. Jim Rohn has helped many people achieve success, including fellow motivational speaker Anthony Robbins. Rohn is known for his powerful speeches that hit the mind and the soul so you are more than ready to get out there and make your dreams come true. My favorite quote – If you don’t design your own life plan, chances are you’ll fall into someone else’s plan. And guess what they have planned for you? Not much.